Schalke pulled off one of the greatest comebacks in Bundesliga history at Borussia Dortmund, Christian Pulisic reached a landmark and Borussia Mönchengladbach confirmed their status as Bayern Munich’s bogey team on Jupp Heynckes’ return to the club. Those numbers and plenty more in the Matchday 13 statistical breakdown. Freiburg striker Nils Petersen now has 12 Bundesliga goals to his name since promotion in 2016, but he scored just his second as a starter in the 2-1 win over Mainz. Gladbach notched up their third victory over Bayern since the start of the 2014/15 season – more than any other club has managed against the record champions. 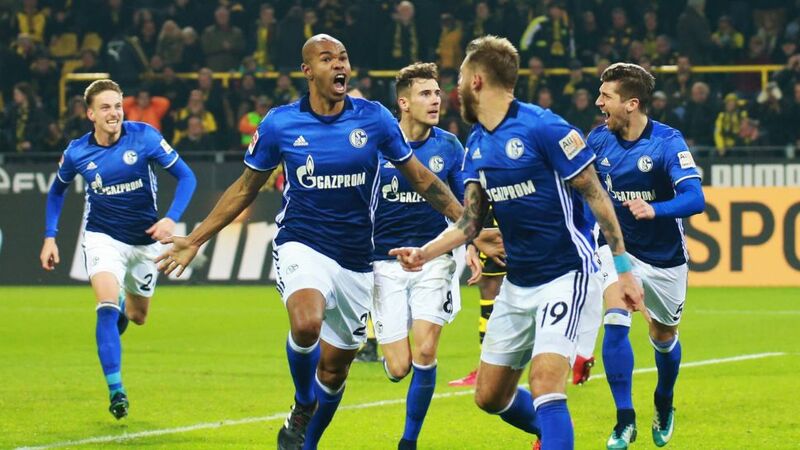 Schalke wrote Revierderby history with their comeback in Dortmund as they became only the second team in Bundesliga history to turn around a four-goal deficit to claim a point. Previously only Bayern have managed that at Bochum in 1976 (6-5 win from 4-0 down). Kevin Volland’s eighth goal of the season came against Eintracht Frankfurt, putting Bayer Leverkusen 1-0 up for the fourth time in 2017/18 – more often than any other player. Five goals from substitutes this Matchday is a new record for this season. Hannover have the most goals from the bench this campaign (5). Niclas Füllkrug got the most recent one to rescue a draw against Stuttgart. The striker’s three goals as a substitute this season are a league high. Six of Naby Keita’s ten Bundesliga goals have put RB Leipzig 1-0 ahead. Schalke are on a seven-match unbeaten run (W4, D3) and are currently seven points better off than they were at this stage last season. Stuttgart registered their first point away from home at the seventh attempt this season with a draw at Hannover. It was also the first time they have taken the lead in a game away from the Mercedes-Benz Arena. The Revierderby saw more goals than any other match so far this season. The last time a game finished 4-4 in the Bundesliga was in September last year between Mainz and Hoffenheim. Leverkusen are unbeaten in their last eight games (W4, D4), which is their longest run in over a year and a half. Freiburg have won ten of their 11 points at home this term, losing just once at the Schwarzwald Stadion. Hertha Berlin captain Vedad Ibisevic now has ten goals against Cologne - more than against any other club. Leipzig have won 13 of a possible 15 points in their five Bundesliga matches following UEFA Champions League fixtures. Last season’s runners-up remain unbeaten at home this campaign, winning 16 of a possible 18 points. Yann Aurel Bisseck became only the second 16-year-old to play in the Bundesliga, and the youngest player in Cologne’s history. Stuttgart’s Takuma Asano became the 17th Japanese player to score in the Bundesliga with his strike at Hannover. Augsburg’s 2-1 victory over Wolfsburg was their fifth win of the campaign and moves them onto 19 points, which is more than they managed in the whole of the first half of last season (18). Gladbach hosted Bayern for the 50th time in the Bundesliga and beat the record champions for the 20th time. The Bavarians have now lost more matches at Mönchengladbach than at any other Bundesliga team. Roman Weidenfeller took to the pitch for his 24th Revierderby to equal the record held by Schalke legend Klaus Fichtel. Bayern were unbeaten in their last 25 competitive games under Heynckes. The loss in Gladbach was their first under the veteran tactician since March 2013 (vs. Arsenal). The last time the treble-winning coach lost in the Bundesliga was October 2012 – a 30-game run ended by his former club. Augsburg’s 26 shots on goal against Wolfsburg equalled a club record for this season. Nineteen-year-old Christian Pulisic became the youngest Dortmund player and youngest non-German in Bundesliga history to make 50 league appearances. Only Timo Werner and Julian Draxler have reached the landmark at a younger age. Pierre-Emerick Aubameyang became the Bundesliga’s leading African goalscorer alongside Tony Yeboah with his 96th top-flight goal at home to Schalke. Leon Goretzka made his 100th Bundesliga appearance when he came off the bench at Dortmund to inspire his Royal Blues to an historic comeback. Hoffenheim’s Kevin Akpoguma scored the 1000th own goal in Bundesliga history when he put into his own net at Hamburg.